[T]he question is trying to really move forward toward the establishment of a Palestinian state that uses all the tools that we have -- the roadmap, if possible the Arab initiative, the -- I continue to believe that one of the most important speeches of all time is the Sharon Herzliya speech -- the President's various interactions with these leaders, and the desire I think now across a broad range of both polities for a two-state solution. Twenty-seven months ago the Palestinian Authority commenced a campaign of terror against the State of Israel. Since then, we have been confronting a ferocious battle against a culture of bloodshed and murder, which has targeted Jews and Israelis everywhere. . . . This is not the place to ask what led the PA Chairman to question the inner strength and determination which has always characterized the citizens of Israel, but it is clear that the terror has not defeated and will never defeat the State of Israel. They tried to break our spirit -- and failed. On June 24th this year, President Bush presented his plan for a true solution to our conflict with the Palestinians. The peace plan outlined in the President's speech is a reasonable, pragmatic and practicable one, which offers a real opportunity to achieve an agreement. . . . After concerted efforts, the U.S. Administration has understood and agreed that the only way to achieve a true peace agreement with the Palestinians is progress in phases, with the first phase being a complete cessation of terror. Only after a cessation of terror . . . will the commencement of peace negotiations between the parties be possible. . . . It was indeed a great speech. But it is not the speech Condi meant. It could not have been: the entire purpose of her trip was to apply maximum pressure, on the weakest government in Israeli history, to forego the basic principle that Sharon had established, and which lays at the heart of the Roadmap: no peace negotiations until terror ceases. The Roadmap is a clear and reasonable plan, and it is therefore possible and imperative to implement it. The concept behind this plan is that only security will lead to peace. And in that sequence. Without the achievement of full security within the framework of which terror organizations will be dismantled it will not be possible to achieve genuine peace, a peace for generations. This is the essence of the Roadmap. The opposite perception, according to which the very signing of a peace agreement will produce security out of thin air, has already been tried in the past and failed miserably. And such will be the fate of any other plan which promotes this concept. These plans deceive the public and create false hope. There will be no peace before the eradication of terror. But it’s not likely Condi meant that speech either. Later in the speech, Sharon said that “[t]he government under my leadership will not compromise on the realization of all phases of the Roadmap.” It is unlikely he would have countenanced Rice’s plan to do Phase III first and circle back to Phase I later. I take this opportunity to appeal to the Palestinians and repeat, as I said at Aqaba: it is not in our interest to govern you. We would like you to govern yourselves in your own country. A democratic Palestinian state with territorial contiguity in Judea and Samaria and economic viability, which would conduct normal relations of tranquility, security and peace with Israel. This is a fateful hour for Israel. We are on threshold of a difficult decision, the likes of which we have seldom faced, the significance of which for the future of our country in this region is consistent with the difficulty, pain, and dispute it arouses within us. . . . This is a people that has courageously faced and still faces the burden and terror of the ongoing war, which has continued from generation to generation; in which, as in a relay race, fathers pass the guns to their sons; in which the boundary between the front line and the home front has long been erased; in which schools and hotels, restaurants and marketplaces, cafes and buses have also become targets for cruel terrorism and premeditated murder. . . . I know the implications and impact of the Knesset’s decision on the lives of thousands of Israelis who have lived in the Gaza Strip for many years, who were sent there on behalf of the governments of Israel, and who built homes there, planted trees and grew flowers, and who gave birth to sons and daughters, who have not known any other home. I am well aware of the fact that I sent them and took part in this enterprise, and many of these people are my personal friends. I am well aware of their pain, rage, and despair. However . . . I also believe in the necessity of taking the step of disengagement in these areas, with all the pain it entails, and I am determined to complete this mission. I am firmly convinced and truly believe that this disengagement will strengthen Israel’s hold over territory which is essential to our existence, and will be welcomed and appreciated by those near and far, reduce animosity, break through boycotts and sieges and advance us along the path of peace with the Palestinians and our other neighbors. A long time has passed since then. This land and this region have known more wars, and have known all the wars between the wars, terrorism and the difficult counteractions undertaken by Israel, with the sole purpose of defending the lives of its citizens. In this ongoing war, many among the civilian population, among the innocent, were killed. And tears met tears. We were attacked and stood firm, with our backs to the sea. Many fell in the battle, and many lost their homes and fields and orchards, and became refugees. This is the way of war. However, war is not inevitable and predestined. Even today, we regret the loss of innocent lives in your midst. Our way is not one of intentional killing. Sharon went through with his disengagement ten months later, although by then he must have known he was turning over Gaza to Hamas. He consoled himself that at least he had made “a deal with the Americans,” as he told the Israeli newspaper Yediot Aharonot on the eve of withdrawal. Under the Disengagement Deal, Sharon received an express promise from the United States that the only avenue forward after disengagement would be the dismantlement of Palestinian terrorist capabilities and infrastructure -- before any negotiations on borders, refugees, Jerusalem or any other final status issues. Sharon would have been shocked to learn that, this past Monday, Condoleezza Rice came to Jerusalem to urge Israel to start negotiating final status issues, without insisting on either Phase I or Phase II of the Roadmap as necessary preconditions to such negotiations, and cited Sharon’s “Herzliya speech” to support the disavowal of that deal. Richard Baehr in today’s American Thinker has published Part II of his important new article: “The War Against Israel in America.” Part I was published on March 21 (and is discussed at the end of this prior JCI post). The two articles are essential reading. Americans see the hypocrisy among those who back the Palestinians and yet whitewash their behavior, and who focus only on Israel's imperfections. For all its faults (there are no perfect nations), Israel is admired by many Americans for its resolve, its military toughness and sacrifices, its economic and technological achievements in agriculture, desalinization, computer science, and medicine, all shared with countries around the world, its friendship and strategic partnership with America . . . and most of all for its western culture, democratic values, first amendment type freedoms, and respect for minorities. Where in the Arab world are any of these seen? Baehr is particularly good on rebutting the Anti-Israel Lobby’s common misconception that UN Resolutions 242 and 338, the foundational principles of the international community, require a complete withdrawal from the West Bank. In fact, that position was explicitly rejected during the lengthy consideration of Resolution 242 in 1967, which Baehr recounts in considerable detail. Let me add a historical footnote to Baehr’s summary. Thirteen years after Resolution 242 was adopted, Jimmy Carter (natch) -- in a fit of pique at Menachem Begin -- allowed the U.S. to vote on March 1, 1980 in favor of a non-binding U.N. resolution that repeatedly (six times) referred to Jerusalem as “occupied territory.” It marked the first time, according to the New York Times, that the U.S. had voted against Israel on a major issue.
. . . The facts are that I never described Jerusalem as occupied territory. . . . Resolution 242 in no way refers to Jerusalem, and this omission was deliberate. . . . In a number of speeches at the UN in 1960, I repeatedly stated that the armistice lines fixed after 1948 were intended to be temporary. This, of course, was particularly true of Jerusalem. At no time in these many speeches did I refer to East Jerusalem as occupied territory. . . . I made it clear that the status of Jerusalem should be negotiable and that the armistice lines dividing Jerusalem were no longer viable. In other words, Jerusalem was not to be divided again. When George Ball, my immediate successor, visited Amman on July 16, 1967, he quoted King Hussein as having said he personally recognized that there must be flexibility on the question of Jerusalem and that there could be no return to the pre-June 1967 status. This statement is in the reporting telegram of Ball’s visit to King Hussein. Carter’s action not only was a grievous gratuitous insult to an American ally, but started a process whose deleterious effects are apparent today -- by encouraging Arab grievances to be aired in the UN as a more hospitable forum than the process Resolution 242 envisioned. In Carter’s recent book, he provides a disingenuous description of Resolution 242 and includes seven documents as appendices. He omits George W. Bush’s landmark speech of June 24, 2002, the Quartet’s Roadmap, and the formal April 14, 2004 exchange of letters between the U.S. and Israel that set forth the Gaza disengagement deal. But he includes the infamous 1980 resolution. Baehr's articles are an important antidote to this misinformation. Tomorrow morning, the California Assembly Committee on Public Employees, Retirement and Social Security will hold a hearing on Assembly Bill 221, which would prohibit California’s state pension plans from investing in companies with business operations in Iran. California law already prohibits state pension plans from investing in companies with operations in Sudan. In the case of Sudan, a genocide is being carried out while being denied. In the case of Iran, the genocide is being openly threatened and actively planned. Passage of AB 221 is an important opportunity to act while action is still possible. JCI sent the letter below by fax and email yesterday to the author of AB 221, with a copy to the Chair of the committee. You can fax and/or email a similar letter today, but your action will only be timely if you do it today. The hearing is tomorrow morning. Jewish Current Issues strongly supports AB 221. This bill would prevent public funds from being invested in companies assisting a country dedicated to genocide, and would conform California law to the existing provisions relating to Sudan. Thank you for your efforts and those of your co-authors on this critical legislation. Obviously if we could get the ball rolling to get all these state pension funds to divest from Iraq -- this in addition to what the U.S. Treasury is doing in curtailing banking activity with Iran -- it puts formidable pressure on the regime. . . . I know such resolutions have been fielded in the case of Darfur against the Sudan. I suggest a coalition of liberals and conservatives across the political band in the United States, divesting against genocide -- that is, the one that is being perpetrated, the one that is being denied, and the one that is being planned. I can think of no better purpose, no better moral purpose, no better purpose period. This is what can differentiate our period from the 1930s, by actually doing something. So let’s do it. Israel serves today as the ethical barometer in the western collective mind. Support for it brings no oil, no ingratiation with terrorists, no psychological lift of the usual easy bullying of a small democracy, but it does reveal respect for democracy, confidence in the history of the West, and respect for a humane culture and an accomplished people under terrible assault. So, I confess, as I age I sort of judge Westerners I meet now by their degree of fairness toward Israel. I've gotten to the point when I hear a rabid Leftist or a creepy Right-wing nut rant on Israel, I just pack it up and walk away. Life is too short for such nonsense. The rest of the interview is also worth reading. 2. Yehuda Krinsky (Lubavitch) CEO of Chabad -- “has truly built a ‘shul’ on every corner and brought the Chabad movement mainstream prominence.” [Wikipedia entry here]. 11. Peter J. Rubinstein (R)” – “the spiritual leader of NY’s Central Synagogue.”12. Eric Yoffie (R) President of the Union of Reform Judaism. 13. Harold M. Schulweis (C) – “considered the leading Conservative Rabbi of his generation.” [Valley Beth Shalom in Encino]. 14. Saul J. Berman (O) -- “considered one of the most forward thinking Jewish scholars of his generation.” [Bio here]. 15. Zalman Teitelbaum (Hasidim) – [Wikipedia entry here]. 18. David Wolpe (C) Senior Rabbi of Sinai Temple in Los Angeles – “Wolpe is now considered one of the most dynamic pulpit Rabbis in America (also an author [of six books]).” [Latest sermon, “Why the Internet is Not Enough,” is here; latest musing, “The Folly of Proof,” is here]. [Wikipedia entry here]. 19. Sharon Kleinbaum -- Senior Rabbi of the world’s largest synagogue for gay, lesbian, bisexual and transgender Jews” [Congregation Beth Simchat Torah in New York City]. 20. Dan Ehrenkrantz (Reconstructionist), Reconstructionist Rabbinical College. Not that the next 30 are chopped liver: they include Joseph Telushkin, Irving Greenberg, Abraham Cooper, Elliot Dorff, Rachel Cowan, Naomi Levy and Mordechai Finley. “Withdrawal from Gaza,” produced and directed by Joel Blasberg, is an extraordinary documentary film that should not be missed. It opens today (through next Thursday) at the Laemmle Encino Town Center Theater and will be part of the Beverly Hills Film Festival April 11-15, after which it moves to the Santa Cruz Film Festival April 20-28 and the Lenore Marwin Jewish Film Festival in Detroit April 29-May 10. There are a couple two-minute clips from the film here. The film captures the beauty of Gush Katif and its people, documents the sensitivity with which conflicted soldiers (some wearing kipas and long beards) carried out their duties, and presents various points of view about the withdrawal without resorting to either polemics or theatrics. It is all the more powerful because the event is portrayed in an understated way. JCI: Joel could you tell me how you came about making this remarkable film? Blasberg: Well, I hadn’t made a documentary before, but months before the scheduled withdrawal I thought that it was important to record what I thought would be a very historical and very emotional and very traumatic event in the history of the Jewish people. So I went over months earlier and I visited all the settlements, and decided that it was worthwhile, and I came back about two months before the withdrawal and moved into Gush Katif and hired a group. JCI: And what is the principal lesson you think people should draw from the film? Blasberg will be at the Saturday evening and Sunday matinee screenings this weekend. Kristof’s piece is part of a growing genre: criticism of Israel whose starting point is to bemoan how such criticism cannot be made in public. Interesting, isn’t it, that the argument I made automatically put me, in your mind, in the “enemy of Israel” camp? This is exactly what Kristof was arguing. Friends of Israel with differing opinions of what’s in its vital interests are quick to be branded and attacked. But your predictions of an Emerging Kristofian Majority and the death of the pro-Israel consensus seem (with apologies to Mark Twain) greatly exaggerated. Believe me, such prognostications have been around for at least 40 years. In the 1970s it was claimed (and not just by ex-Harvard Crimson types, but by some really scary generals and politicians) that our support for Israel was forcing the Arabs into the arms of the Soviets. You remember the Soviets. Then it was said, over and over and over, that Israel would commit demographic suicide. Yet Jews have kept a solid and remarkably enduring majority in the entire Land of Israel since 1967. So majority-rule-warnings don’t cut much ice there either. Does that mean I am personally wedded to a maximalist view of the conflict? Not necessarily -- it might well be enough for me if the Palestinians literally and figuratively grew up and changed from super-weaponized, hyper-politicized, perpetually-aggrieved gang members into genuinely civilized people. But that will take at least the rest of your lifetime. That is, I’m assuming that -- since you seem to think Kristof is on to something -- you are too young to have experienced a thousand identical columns by Anthony Lewis. Lucky you. For future historians, let’s catalogue the obscure media to which the small band of brave critics of Israel in America have been relegated over the past year: the Harvard University School of Government website, the op-ed page of the New York Times, lead articles in the New York Review of Books, and the New York Times best seller list. It covers almost exactly the same points -- Soros praises himself for how brave he is for criticizing Israel, paints himself as the victim of unfair charges of anti-Semitism because of his honesty, insists that Jewish interest groups prevent honest criticism of Israel in the United States (unlike the strong self-criticism within Israel), states that Israel is mostly to blame for Palestinians’ hatred of it, and recommends that the United States should deal politically with the reasonable elements that he finds in Hamas and send aid funds to a Hamas-led government. Or do these same few talking points simply define a new genre and a new generation of anti-Israel politics? Do we as a country consider Hamas and Hezbollah really good people, but some Zionists are paying off our Congressmen to call them terrorists? Am I supposed to believe that many in our government really despise Israel and want to empower her enemies, but they’re “biting their tongues”? They would’ve been cheering for the Hezbos last summer, but they were afraid they might receive a petition from Simon Wiesenthal Center? Richard Baeher, in Part One of a major article at American Thinker (“The War in America Against Israel”), notes Kristof’s column as part of a trend that indicates a bumpy ride is coming up, starting around the 40th anniversary of the Six-Day War, with the New York Times taking the lead. Worth reading in its entirety. 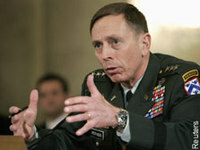 It is an extraordinary description of the fourth-generation military doctrine that Lieutenant General David Petraeus, the author of the U.S. Army’s latest counterinsurgency field manual and now as commander of American ground forces in Iraq, is now using, placed in an historical and political context. The New York Review of Books has posted an article by George Soros entitled “On Israel, America and AIPAC.” He has identified the organization that has “endangered” Israel’s existence: AIPAC. He blames AIPAC for Israel’s “insistence on treating Hamas only as a terrorist organization.” He thinks accepting Hamas’s election victory might have strengthened “the more moderate political wing” [sic] of Hamas. He blames the last six-years of violence not on Arafat’s rejection of a state, but on Ariel Sharon’s walk on the Temple Mount. He criticizes Alvin Rosenfeld’s argument that to call Israel “a Nazi state” goes well beyond legitimate criticism. He blames AIPAC for “Israel’s heavy-handed response to Hezbollah last summer.” He goes on. Given Mr. Soros' significance as the moneybags of the activist core of the Democratic Party, it is going to be illuminating to see how the party reacts to the billionaire's call for the party to "liberate itself from AIPAC's influence." In his New York Review of Books piece Mr. Soros comes awfully close to buying into the whole paranoia of Professors Mearsheimer and Walt. There is a long string of comments on Soros’s piece at Marty Peretz’s blog. UPDATE (3/21): The New York Sun reports that Barak Obama, Rep. Robert Wexler (D-Fla), and Eliot Engel (D-NY), among others, have announced their disagreement with Soros’s position. Susan Turnbull, vice chairman of the Democratic National Committee, said “I don’t necessarily agree with [Soros]” about AIPAC. (H/T Ed Lasky). Jason Maoz’s Media Monitor at The Jewish Press has posted "Web Choices 2007" -- his annual list of worthwhile websites and blogs. There are now 72 sites on his list. Over at COMMENTARY, there is an impressive new blog -- “Contentions” -- with another list of important links, which includes several that are not on the Media Monitor’s. If you add the additional sites from Contentions to the Media Monitor list, plus the other ones on the JCI list to the left, you would have approximately 100 significant sites, almost all of which post daily (and many of which post multiple times each day). And even that list would be incomplete. We’ve come a long, long way since the time we had to rely on CBS, NBC and ABC and The New York Times. To see how far, and to read an important reflection on the Iraq war, the mainstream media and the blogosphere, do not miss Michael Yon’s extraordinary post from a tent in Baghdad. It is essential reading.